When many of us enter a facility building, we aren’t thinking about the potential hazards that exist. Unfortunately, the truth is that anytime you walk into a facility with unprotected floors you’re at risk for a slip and fall accident. This is something many facility managers take into consideration on a daily basis. Leaving floors slippery and unprotected can cause a great number of potential problems. That’s why if you own or manage any kind of facility, it’s extremely important to take preventative measures. Not doing so can lead to serious injuries, costly lawsuits and much more. Since we know how crucial it is to be prepared, we decided to outline ways you can protect your facility from slippery and unprotected floors. The key to keeping floors both safe and clean is being able to keep up with facility maintenance. This comes as no surprise to many facility managers who face this challenge daily. When facilities experience a high amount of foot traffic, the dirt and debris from the bottom of shoes can be spread throughout the entryways and beyond. Unless you have a large maintenance crew on staff, this can be a challenging task to keep up with. Leaving floors slippery and unprotected could lead to slip and fall accidents and damage to your flooring. Floors with chips or cracks can become a hazardous to employees or anyone else who enters your building. Keeping up with the daily maintenance of your facility can help prevent this from happening to you. After discussing the importance of keeping up with facility maintenance, many buildings managers may find themselves feeling short staffed. What if you could eliminate the need for more employees while keeping your facility clean? That’s where commercial mats come into play. 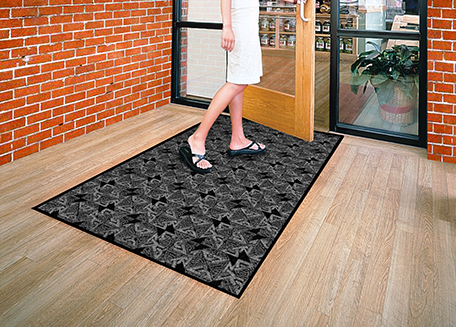 Commercial mats act as silent facility managers in areas that cannot be occupied throughout the day. Placing proper commercial mats on even flooring can trap dirt dust and debris and grip to floor surfaces. 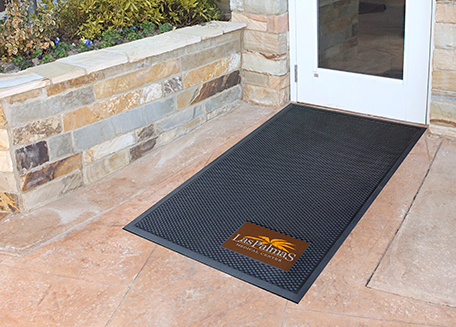 A high-quality mat will ensure that your facility remains clean and safe for anyone who walks through it. They are a critical component when it comes to reducing injuries, lawsuits and protecting against slippery floors. Entryways are where slippery and unprotected floors are often seen. When you place commercial mats in these areas, you are reducing the amount of wear and tear your facility floors are experiencing. If these floors are left unprotected, overtime heavy foot traffic can deteriorate them and leave them less than secure. That’s why if you’re looking to prevent slippery floors, the entrances of your building are a good place to start. Strategically securing entry ways with commercial mats is a quick and easy way for your facility to accomplish this goal. Don’t allow your facility to be prone to slip and fall accidents just because you didn’t take preventative measures. Looking to prevent slippery and unprotected floors in your facility?